Author: Gareth Hawkes and Mitchell Berger at the University of Exeter. Magnetic helicity is a measure of how twisted and interlinked the magnetic field is , given as the integral over all (relevant) space of the product of the magnetic vector potential and magnetic field. As the poloidal field lines emanating from the photosphere are wrapped around each other by the differential rotation at and below the solar surface, helicity increases directly in line with the amount of toroidal field being captured for a following cycle’s sunspots. Here, poloidal field refers to that which has a component normal to the surface, whereas the toroidal field does not. We theorise that the magnetic helicity flux during a solar minimum and the strength of the following cycle (determined by the sunspot number) should be well-aligned. In the video below, we plot a potential field source-surface (PFSS) model of the magnetic field out to two solar radii, over the total time period used in the following study. Between solar cycles, the magnetic field is predominantly polar (with its polarity being flipped during each cycle). This polar field slowly descends over a solar cycle, forming much more complicated structures. Figure 1. Magnetic field plots averaged over successive Carrington Cycles CR1642 - CR2178. The polar field strength of the magnetic field has been used as a strong predictor of the upcoming solar cycle , amongst other techniques. Differential rotation wraps the polar field around the axis of the sun, creating the toroidal field seen in sunspots. The most fundamental attempts employ flux transport to model a simplified version of the solar dynamo (e.g. ). However, slight changes in the model parameters can result in wildly different results, which can be seen by comparing to other similar models ; while one model  made an accurate prediction of the strength of Solar Cycle 24, the other  made an under-prediction. In these models, there is also a large dependence on initial conditions. Magnetic helicity flux is given by the alignment of the magnetic field’s vector potential with that of the velocity field on the photosphere, multiplied by the magnitude of the radial magnetic field as a scale factor. Helicity injection results in a stronger toroidal field, with a measureable coefficient describing the degree to which the poloidal field has wrapped around the toroidal field. Taking our velocity field as the differential rotation profile only gives a measure of the helicity injection or ejection due to the effect of differential rotation, or in other words how wrapped our field lines have become. This is equivalent to increasing the strength into the following cycle’s toroidal field. Whilst polar field does make up the majority of helicity injection, it disregards helicity generation in the sub-polar regions. Thus, magnetic helicity should be an as strong, if not stronger, predictor of the upcoming solar cycle as compared to at least polar field. In Figure 2 we give the magnetic helicity flux in the northern hemisphere against total sunspot number for the period 1976-2018. Magnetic helicity is calculated using magnetic field data provided by the Wilcox Observatory, in the form of spherical harmonic co-efficients of a Potential Field Source Surface model. The velocity field representing differential rotation is taken from an analytical formula. Normalisation is performed relative to the highest peak in an individual data set. There is a clear correlation over the first two cycle pairs (a cycle pair refers to a helicity cycle followed by its closest sunspot cycle), as predicted. The weakest correlation is in the most recent cycle, where we saw an abnormally weak level of solar activity at the beginning and during the Solar Cycle. Figure 2. 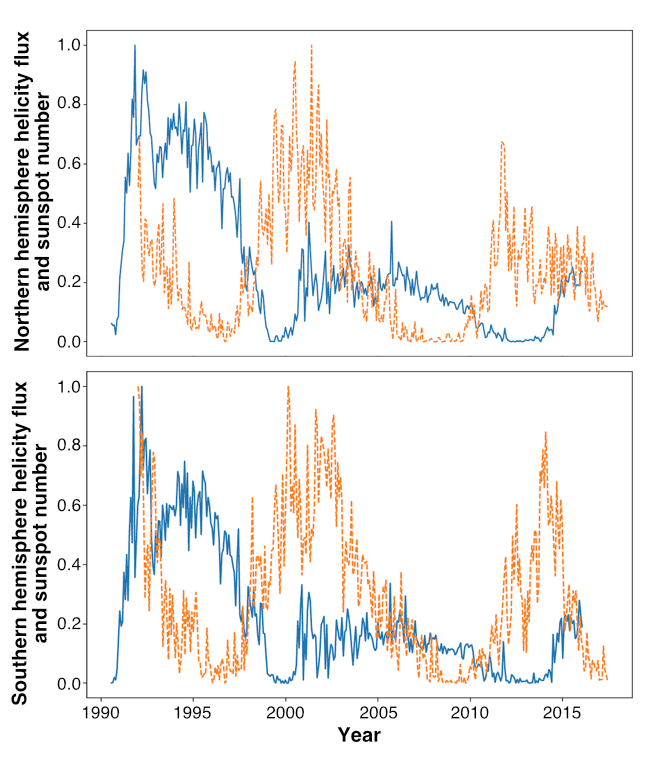 Magnetic Helicity Flux (blue) due to differential rotation in the northern hemisphere versus total Sunspot Number (orange) for the period 1976-2018. Table 1. Comparison of the ratios of the integration of the two quantities magnetic helicity flux and polar field with that of the following sunspot cycle. Does helicity flux out-perform polar field? In Table 1, we give the ratio of the integrated values of magnetic helicity flux and polar field with respect to sunspot number. Here, polar field is taken as the absolute value of the average radial field over a fifteen degree polar cap. Naturally, integrating helicity flux gives a value of the amount of helicity which has been injected/ejected in time t. Integrating over sunspot number is less physically meaningful, but should be representative of strength when we consider that sunspots which are counted over two consecutive data points are likely to be more intense due to their longevity. These ratios should then correspond to how well the “amounts” of helicity and polar field generated during a cycle correlate with the “amount” of sunspot activity. We see a clear preference for helicity flux, where the ratio is consistently higher. Figure 3. 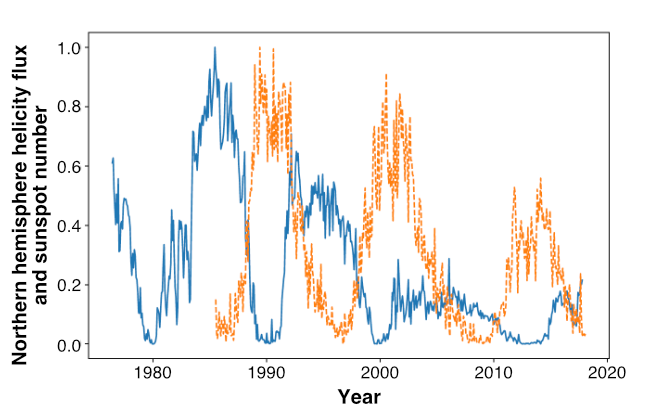 Magnetic Helicity Flux (blue) due to differential rotation versus Sunspot Number (orange) for the period 1990-2018. The top panel shows the northern hemisphere, the bottom shows the southern. If we properly entertain the idea that the dynamos governing the northern and southern hemispheres could be imperfectly coupled or out of sync, we achieve much better results for the most recent solar cycle, the results of which are shown in Figure 3. Here, we plot magnetic helicity flux versus sunspot number, both of which are now constrained to the their respective hemispheres: North in the top panel and South in the bottom. This data set is limited to 1990-2018, due to a limitation in data availability. Importantly, the weakest (most recent) cycle pair are now much more closely aligned in terms of their normalised amplitude, for the Northern hemisphere. In the South, we see a stronger alignment of the 1990 cycle. We conclude that magnetic helicity appears to be a stronger predictor of solar activity than polar field strength. This may be due to the association of helicity flux with the generation of toroidal field which governs the next solar cycle. Additionally, we found evidence that supports the theory that the dynamos in the north and south are either imperfectly coupled or at minimum out of phase with each other. We invite you to read  for a more detailed analysis. The Wilcox Solar Observatory data used in this study to calculate magnetic helicity flux were obtained via the web site wso.stanford.edu, courtesy of J.T. Hoeksema, with thanks. Sunspot Number Source: WDC-SILSO, Royal Observatory of Belgium, Brussels. G. Hawkes would like to thank the STFC for their funding under grant ST/N504063/1. Berger, M., Field, G.B. : 1984, The topological properties of magnetic helicity. J. Fluid Mech. 147, 133. Hathaway, D.H.: 2009, Solar cycle forecasting. Space Sci. Rev. 144, 401. Choudhuri, A.R., Chatterjee, P., Jiang, J.: 2007, Predicting solar cycle 24 with a solar dynamo model. Phys. Rev. Lett. 98, 1. Hawkes, G. & Berger, M.A. Sol Phys (2018) 293: 109.